A group of tough and sturdy deciduous trees and shrubs with attractive berries and good autumn colour. Makes an ideal specimen tree for a small to medium size garden. The autumn fruits are very attractive to birds. Foliage: Deciduous, mid-green simple pinnate leaves, often colouring brilliantly in autumn. Flowers: Clusters of small white or pink flowers, followed by colourful berries (white, yellow, pink, red or brown depending on variety). Soil: Moderately fertile, humus-rich, well-drained (sand or loam). Acid or neutral pH. Conditions: Full sun, any aspect, in an exposed or sheltered location. Hardiness: Fully hardy in the UK. Plant in autumn or winter (November-March), in a well drained moderately fertile, humus-rich soil. Site in full sun or partial shade. Container-grown trees are best planted in early spring. Pollution tolerant. An excellent choice for confined spaces. Easy to grow low-maintenance trees, needing very little care and attention once established. No routine pruning necessary. Can be lightly pruned or thinned during the autumn or winter, if necessary. Susceptible to attack by aphids, blister mites and sawflies. Can be affected by canker, silver leaf and fireblight. Sow seed in autumn when ripe or take softwood cuttings in summer. Cultivars do not come true from seed. Species will frequently hybridise and self seed around the garden. S. aria (whitebeam) is a small tree with silver green emerging foliage that later fades to green. Clusters of white flowers that become orange/red berries in the autumn. Very hardy tree. Height to 26ft (7m). Available at Thompson & Morgans and Notcutts. S. aucuparia (mountain ash, rowan) is a small tree with good autumn colour. White flowers appear in late spring followed by large hanging clusters of orange-yellow berries. Height from 20ft - 50ft (6-15m). Available from Notcutts. S. a. 'Asplenifolia' which has deeply toothed fern-like leaves. S. a. 'Ember Glow' has dark blue-green, pinnate foliage that turns to shades of red, orange and bronze in autumn. Available from Thompson & Morgan. S. a. 'Sheerwater Seedling' is a narrow upright tree with erect branches. S. a. 'Xanthocarpa' has orange-yellow berries. S. bupebensis is a compact tree with blue-green leaves, turning red in autumn. White, tinged pink, berries in August-September. Height to 40ft (12m), spread 26ft (8m). 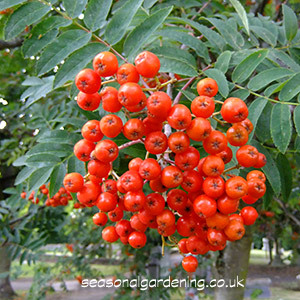 S. 'Embley' (Japanese Rowan) is a vigorous grower with good upright branches when young. 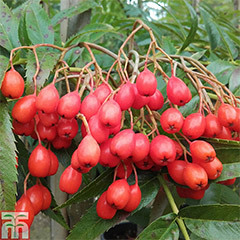 Produces large clusters of bright red fruits. Height up to 40ft (12m), spread 26ft (8m). S. 'Joseph Rock' is an upright medium-sized tree with bright yellow berries in the autumn. Striking autumn leaf colours of orange, red and purple. Height to 25ft (7.5m). One of the best choices for small gardens. Available from Notcutts. S. sargentiana (Sargent's Rowan) has a open, sparsely branched habit. Orange-red berries form in large clusters in September. Height and spread up to 26ft (8m). One of the best Rowans for autumn colour. S. ulleungensis (Ulleung Island rowan) is a small, columnar tree with good autumn colour of vibrant reds and oranges. Creamy-white flowers appear in late spring followed by clusters of shiny red berries. Popular cultivars include 'Olympic Flame'. Available at Thompson & Morgan. S. vilmorinii is a small spreading tree with fern-like leaves. Fruits are red to white, flushed with pink in September. Height and spread up to 20ft (6m).